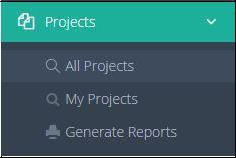 To view List of Projects, you need to go to the side bar on the left side bar and click for “Projects”. All Projects - Admin to view all list of projects. My Projects - Project’s Team Members to view the project that they are involving. Generate Reports - generate reports based on certain query . Below is the List of the Projects.